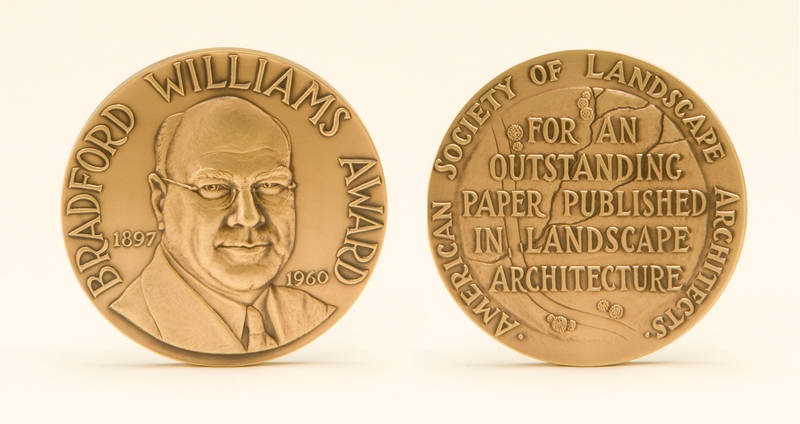 This medal is given in honor of Bradford Williams, who for many years served as the "corresponding secretary of ASLA" and presided over ASLA national headquarters in Boston. He was past editor, publisher, business manager and the driving force behind Landscape Architecture Quarterly (now Landscape Architecture Magazine). Purpose: To recognize superior writing in Landscape Architecture Magazine (LAM) and excellence in writing about landscape architecture in other mainstream periodicals. Eligibility Requirements: Individual landscape architects or non-landscape architects who have written at least one article in Landscape Architecture Magazine during the course of that calendar year, and outside writers for other periodicals that have written an article on landscape architecture-related topics during the calendar year. Number Given: Up to two medals given annually. Selection Process: The LAM Editorial Committee nominates articles and makes the final selections. The medal recipient is then notified by the president and invited to attend the Society's annual meeting for presentation of the award. 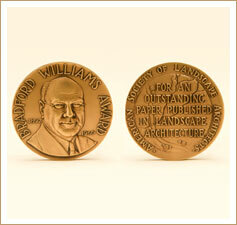 The Bradford Williams Medal will be presented the recipient in person at the annual meeting. If the recipient cannot be present, the medal will be mailed to him or her. There will be two awards given each year, one for an article that appeared in LAM and one for an article on landscape architecture topics that appeared in an outside periodical. The award will be based on articles that have been written during the time period of January to December of the preceding year. Nomination Submittals: To suggest an individual for the committee to consider for the Bradford Williams Medal, email bmckee@asla.org or by fax to Bradford McKee at 202-898-1185.